Chiang Mai, in Thailand’s highlands, is an ancient city with over 300 exquisite temples, it’s culturally rich, vibrant, and offers a wide variety of things to do. In the hills beyond the city, the colorful Lanna culture, unique to Chiang Mai and its surroundings, is seen in every aspect of life, from language to landscape to food. Get out into this spectacular countryside, where Lanna culture is king, and see all its hidden treasures first-hand. Whether you rent a car or scooter, hire a driver for the day, or sign up for an organized tour, plan on a trip outside Chiang Mai’s city limits while you’re in the area. The areas around Chiang Mai are known for their high-quality traditional crafts. Heading east from Chiang Mai along San Kamphaeng Road, you’ll find many silk, weaving, leather, gold, and lacquer “factories” on the way to the famous Umbrella Making Center in Bo Sang Village. Here you can pick up an exquisitely decorated Sa paper umbrella—an authentic Thai souvenir. This center offers demonstrations of the many intricate steps involved in making the umbrellas. The shop itself, with its colorful umbrellas, also makes for an amazing photo-op. 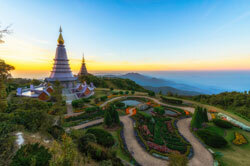 At 8,527 feet, Doi Inthanon is the highest mountain in Thailand and an easy day trip from Chiang Mai. Tree-lined slopes ease into the horizon, as their peaks mingle with wispy-white clouds beneath a pure, blue sky. The glorious sun may force you to shield your eyes from its rays—a small price to pay for such a breathtaking view. The best time for viewing its stunning, multistory waterfalls is during the rainy season (July through October). You can sometimes get a discount off the 400 baht (around $11) entrance fee by bargaining a little or showing a Thai driver’s license. (If you are only passing through, there is no fee.) Plan to leave Chiang Mai by at least 9 a.m. to get the most out of the day. Sitting atop a mountain overlooking Chiang Mai, Doi Suthep is an easy drive or a strenuous bike ride. From this famous hilltop temple, you’ll enjoy panoramic views of the sprawling city below and of the Ping River weaving its way into the distance. It is a steep, grueling, 306-step climb to the temple’s entrance. 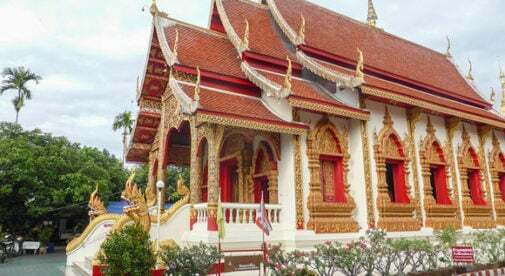 But it is a photographer’s paradise, with intricately decorated temples and shrines (carved serpents that line the staircase from top to bottom, for instance), numerous Buddhas, flowering trees, and expansive views over Chiang Mai. Farther along the road is Bhubing Palace, with its extensive flower gardens and greenhouses. Thailand’s royal family stays here when they visit northern Thailand during the cool season. This is also when the flowers are in full bloom. The colorful rose gardens are particularly famous, with petals of every hue around each corner. You can easily spend a couple of hours strolling the grounds and enjoying the crisp mountain air, away from the heat of the valley below. Car rentals are available in Chiang Mai from around $35 a day. Scooter rentals start at about $10 a day. A songtaew (Thai minibus taxi) can be hired for $40 to $50 a day. If you choose this option, plan your trip beforehand and explain clearly to the driver where you want to go. If you ask around, you can always find a driver who speaks English. Southeast Asia’s Top 6 Retirement & Vacation Destinations.